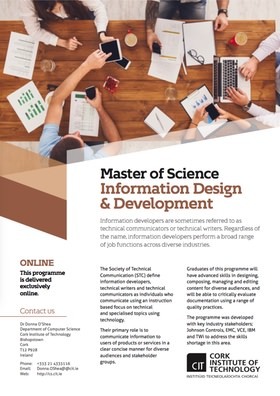 The Department of Computer Science offers five online master's degree programmes, all are delivered online by night. Online delivery offers flexibility that's attractive to people in work who want to upskill but cannot attend a full-time programme. All classes are delivered over the Internet and all practical work is completed using CIT’s cloud infrastructure. Lectures are delivered using Adobe Connect and labs are available 24/7 using CIT’s world-class private cloud environment. Our current online students are based in Ireland, the UK, France, Netherlands, Germany, Russia, Saudi Arabia, Egypt, South America, Canada, Australia and the USA. 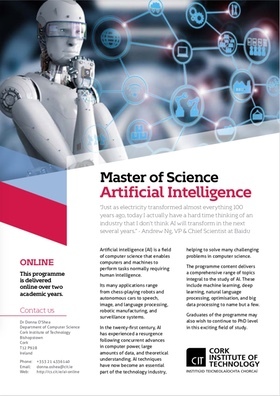 Artificial Intelligence MSc. Study cutting-edge modules in Machine Learning, Deep Learning, Big Data, Natural Language Processing(NLP), Knowledge Representation, Metaheuristic Optimisation, Decision Analytics and many more. 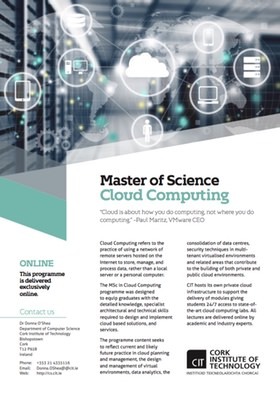 The world's first MSc in Cloud Computing. Launched in 2011 in conjunction with key industry stakeholders EMC and VMWare. Continuously updated with new content to ensure it remains as relevant as ever. Cyber Security MSc, Cybersecurity MSc. Part-time fully online MSc in Information Security has a strong applied focus with in-depth theory. Developed with industry’s leading experts. Cyber Security MSc, Cybersecurity MSc, also available in full-time mode. This innovative master's degree programme was designed to upskill existing software engineers using a flexible online approach. In software, architecture spans across a number of pillars which include the application, system, software and enterprise. The role of information developers is becoming increasingly important given that society is being driven by technology and information developers provide the voice in communicating how issues incorporating technology are framed and developed.